Smash Santa into chimneys, how else do you expect him to deliver presents? 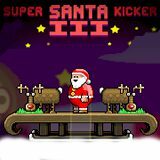 Super Santa Kicker is back, with vengeance! New challenging levels will stump even the best players. Can you beat level 4? This fun filled physics game is the perfect way to pass your xmas boredom... Enjoy!